Decorate your own eggs and put then in this colorful Woven Easter Basket. A fun way for kids to celebrate Easter traditions! 1. Cut out a basket shape from construction paper. 2. Cut long slits all the down the basket, but don't cut all the way through. 3. Cut strips of colored paper. 5. Cut out eggs from white paper and decorate them any way you wish. We used markers you can use stickers, glitter glue or any thing else you have around the house or classroom. If you want to try something really neat, have the kids put Pastel Paper Eggs in their basket! You have a couple of options on how to finish this craft. 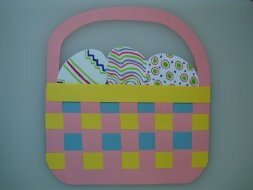 You can glue the entire Basket onto a piece of construction paper, OR you can glue an extra strip of paper on the back to hide the bottom of the eggs and the kids can carry it by the handle.